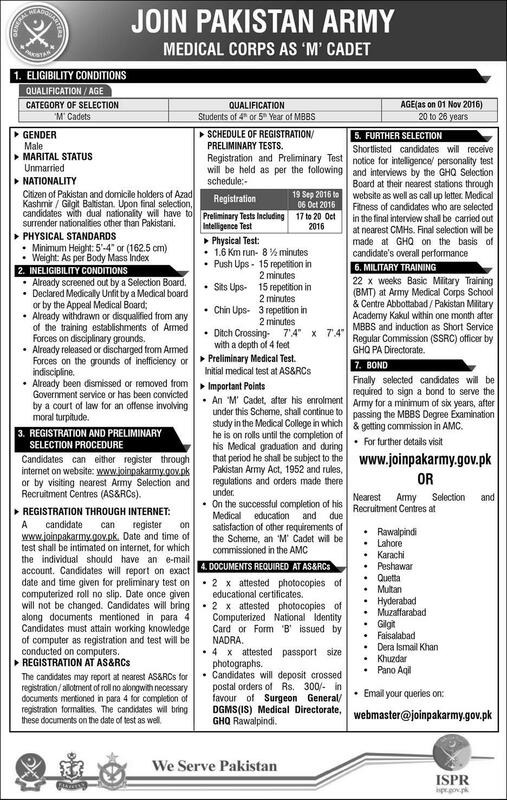 The intake in Pakistan Army Medical Corps as ‘M’ Cadet has just started and all the individuals who have dreamed about becoming part of the country’s armed force can submitted their registration forms in order to become part of the selection procedure. The registration can be done either online through internet or by visiting the nearest AS&RCs. For your ease, below we will guide you about the complete registration process, eligibility criteria and selection procedure. Let’s start by taking a look at the basic eligibility requirements related to age, gender, qualification, nationality, marital status and physical standards. The process to apply for taking part in the selection procedure is really simple and quick. As per their ease, the interested individuals can choose whether they want to register through internet or by visiting the nearest AS&RCs. Both methods are equally efficient and the decision to choose any one of them completely depends upon the applicant’s own comfort. One important thing to remember is that the registrations will remain open only during 19th September to 6th October, 2016 and no late application forms will be entertained. The selection procedure for ‘M’ Cadets consists of preliminary tests that will take place during 17th to 20th October, 2016. First there will be physical test consisting of Running, Push ups, Sits ups, Chin ups and Ditch Crossing. This will be followed by the preliminary Medical Test after which the successful candidates will be shortlisted and called for intelligence/ personality test and interview. The final selection of candidates will be made at GHQ on the basis of candidate’s overall performance in the whole selection process. Once the final selections have been made, the merit lists containing names of selected candidates will be issued which would be available over this page for checking online. The successful candidates will then undergo 22 weeks Basic Military Training at Army Medical Corps School & Centre Abbottabad/ Pakistan Military Academy Kakul within one month after MBBS and induction as Short Service Regular Commission (SSRC) officer by GHQ PA Directorate.